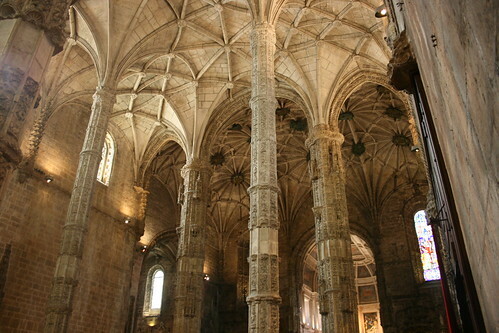 Mosteiro dos Jerónimos, originally uploaded by jhoolko. This beautiful, 500 year-old monastery was a perfect sanctuary from the unexpected summer rain shower that started right as we reached Belém. Still, we tore ourselves away fairly quickly as coffee and hot Pastéis de Belém were waiting for us just down the street. Porto, originally uploaded by jhoolko. Porto was seriously so cool. 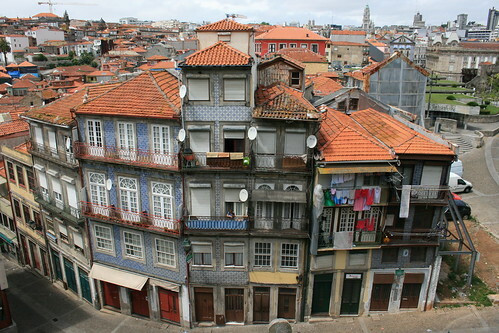 It had such a unique, jumbled, old feel to it that I really haven’t experienced anywhere outside of Portugal. 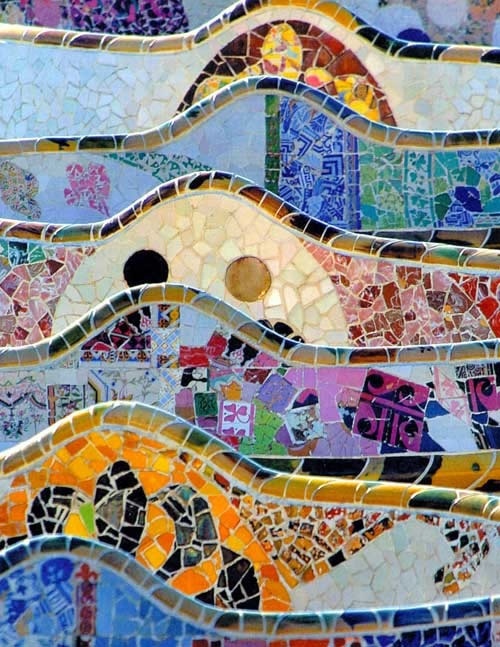 You can see from this picture the way that everything is laid out in a kind of messy yet totally beautiful manner, with all kinds of colors and textures and patterns all running together from one building to the next. It made exploring the town an absolute delight, like I was exploring a melancholy yet festive storybook town. My trip to Turkey was a quick one. In planning our trip to Lisbon from New York, the only airline offering a fare that was even close to reasonably priced was Turkish Airlines, and, being a Turkish carrier, the majority of their international flights include a layover in Istanbul. Now, Istanbul is most definitely not on the way to Lisbon when you are coming from New York. 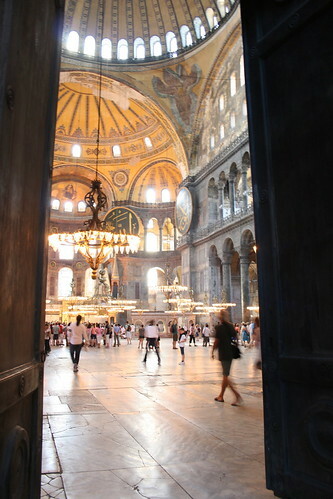 In fact, it is almost laughably out of the way, but in the interest of saving about $400 on the airfare and getting in a short trip to Istanbul, we decided to take the plunge. Our layover only gave us 21 hours in the city, so we just decided to see the best known sites and save the rest for another trip. After being there for less than a day I can now say that I will most definitely be back, because even the little taste that we got of the place was incredible. After a ridiculously short night of sleep in a hot, smelly hostel, and a very early wake-up call facilitated by the azan of the Blue Mosque and some very noisy seagulls, we took off to make our rounds. Our first stop was a quick run-through of aforementioned Mosque, followed by a trip to Hagia Sophia, which was shockingly beautiful. Then we had an obligatory visit to the Spice Market, where we stuffed ourselves with free samples of Turkish delight and some fabulous, sweet apple tea before heading over to the main event. The Grand Bazaar. I feel like I wanted to go to the Grand Bazaar before I ever really knew what it was. When I was little, the idea of a bazaar, any bazaar, was so exciting and so exotic that I always fantasized about the possibility of exploring one and picking up all kinds of wonderful things to bring home. 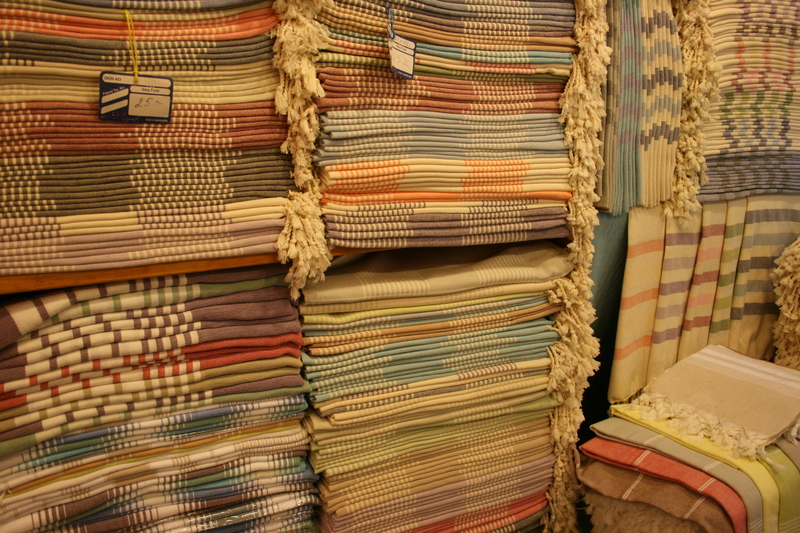 After a bit of poking around, I learned that these are peshtamals (peştamal in Turkish), or hammam towels. They are basically vey soft, very thin towels that come in a variety of beautiful colors and shapes, and they can be used for just about anything, from actual towel to scarf to beach blanket to tablecloth. They are made to be portable, lightweight, absorbent, and fast drying, which makes them awesome for all kinds of things. 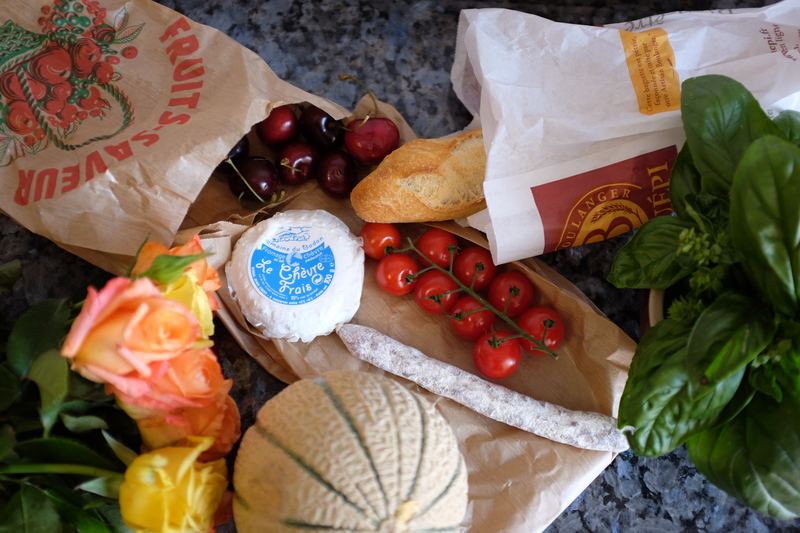 One of the most practical souvenirs I ever brought home was a picnic blanket that I bought on a whim in Paris and now use ALL THE TIME like six years later, so I thought this could be a very useful gift to myself. It also is overall a very practical travel item as it can be used for a million different things without taking up too much room in your suitcase. I’ve gotten used to traveling with some kind of lightweight cloth that can be used as a towel or blanket while traveling, starting first with a cheap sarong, then graduating to a more durable microfiber camp towel (quite possibly in one of the best purchases I’ve ever made), and it’s shocking how convenient it can be to have something like that with you on the road. I love my REI towel, but a peshtemal is a much more fashionable alternative, and almost as compact. If there is any possibility of having a beach visit or an impromptu picnic, either at home or while traveling, I love to have something like this in my bag. I ended up buying a lovely, soft, white and light blue one and my friend picked up two more in other colors. They packed down into nothing and were the perfect soft blanket on the lonnnnng plane ride back to San Francisco. Even better, they were cheap! About $6 or $7 each, which, for the quality that we got, is a lot better than what you can find online in the states, though there seem to be some good deals available on Etsy. My only regret is that I didn’t get more! 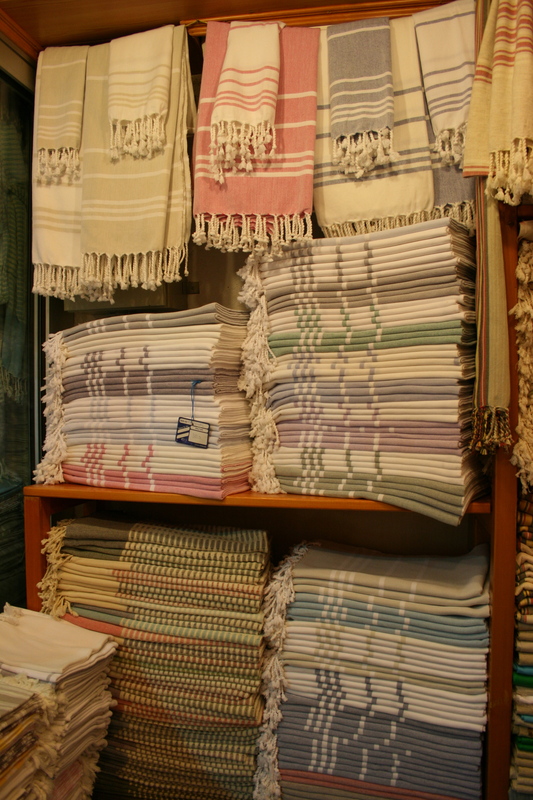 I ended up buying a set of actual Turkish cotton bath towels that were not very practical for packing into a tiny suitcase, but I probably should have invested in a few more peshtemals instead. Right now I’m using mine as a throw in my bedroom, mainly because I don’t want to get the pretty little thing dirty, but I might have to bust it out and use it as an actual towel come summer. Istanbul was absolutely overflowing with wonderful things that could be brought home as gifts, but if you’re looking for something easy and practical that’s not a food item, a peshtamal is the way to go! For more information on where to get them while at the Grand Bazaar, see here or here, or just look around for a while, you’re bound to see them all over the place. Istanbul, originally uploaded by jhoolko. 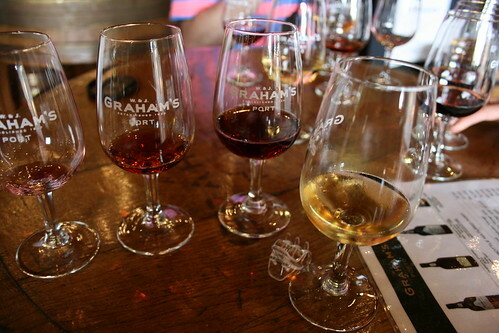 Port Tasting, Graham’s, originally uploaded by jhoolko. While in Porto, a trip across the Douro River to Vila Nova de Gaia to do some Port tasting is pretty much a required activity. If you’re not familiar with Port, it’s a tasty and very drinkable fortified wine that comes in a number of varieties and a rainbow of different shades. The Port Lodges of Vila Nova de Gaia, as they are called, are easily reachable from Porto (via foot or gondola) and many offer inexpensive tours and/or tastings. 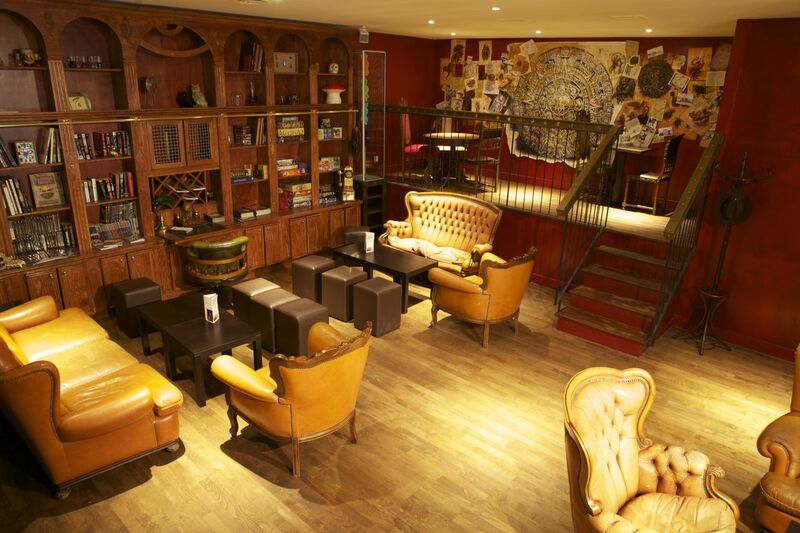 If you are a Port aficionado or have never tried it, I highly recommend a visit. We stopped at a few, and this photo was taken at Graham’s Port lodge where we enjoyed a brief tour and hearty tasting in the company of a few fellow travelers. For more information on the Graham’s Port Lodge and how to visit, click here. 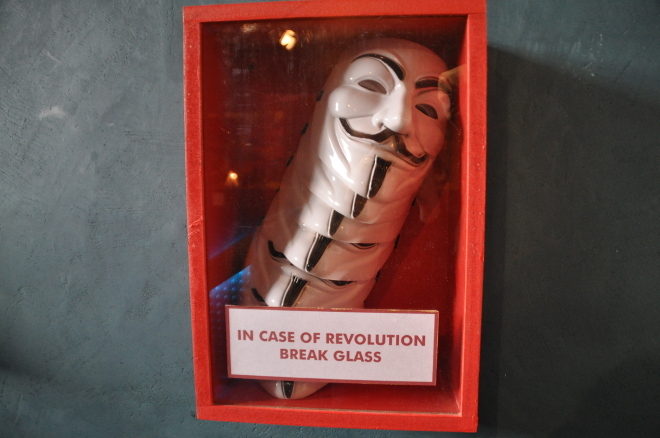 I came across an article in Wired today about a bar that is supposedly the geekiest in the world. 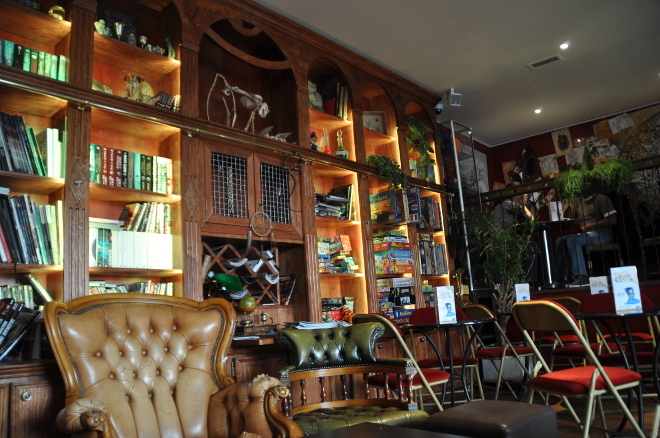 It’s in Paris, and it’s called Le Dernier Bar Avant la Fin du Monde….which means “the last bar before the end of the world.” It does, indeed, look geeky, but in an appealing adult-Disneyland type of way. In addition to a number of very nerdy accessories, the bar also has a weapon deposit box (pre-filled with a selection of famous weapons from movie history) and games attached to urinals in the bathroom. 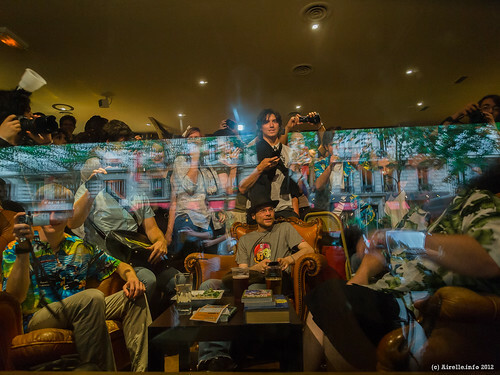 Here are a few photos from Wired (and a few other French sites), check out their full write-up here. If you read French, there are also some Yelp reviews already. One of the things I knew I had to try on my recent visit to Portugal was a horrible sounding concoction called Ginjinha. A syrupy, sickly sweet mixture of sour cherries, sugar, and alcohol (aguardente specifically, so serious alcohol), Ginjinha appears in every travel feature ever on Portugal, and is considered a typical drink of Lisbon, specifically. The resulting tipple tastes a bit like a mixture of Robitussin mixed with firewater with a couple of sour cherries plopped into the bottom if you choose to have them. After the initial shock of the taste of the entire package, the really surprising thing to me was how sour those cherries were! I had the great delight of being offered sourcherry juice regularly on my Turkish Airlines flight over to Lisbon and had decided that I quite liked the stuff, but I was not prepared for the extreme sourness of those puppies. So cherry fans beware! The menu at a Ginjinha bar in Bairro Alto. 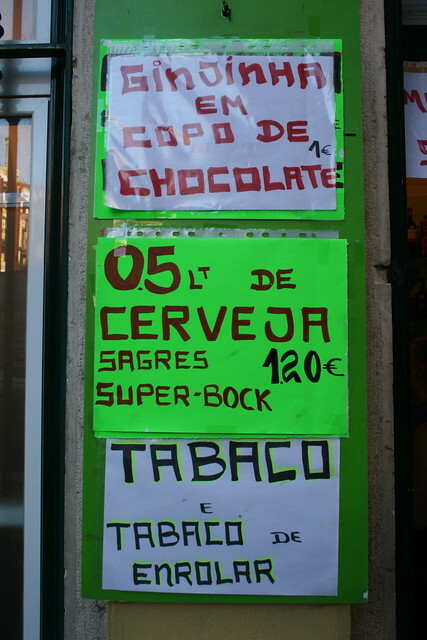 All they served was Ginjinha in chocolate shot glasses, half liter bottles of Portuguese beer, and rolling tobacco. So why, you may ask, did I repeatedly indulge in something that I clearly was not that big a fan of? Why would I go back again and again to punish my tastebuds with flavors I am pretty sure I never want to have in my mouth again? Well, the truth is, the entire practice of drinking Ginjinha is just so great, so exactly the kind of thing I want to do when I am in Europe, that it could have been mud for all I cared; I was in Portugal, and I was going to do as the guidebooks told me the Portuguese did! Ginjinha is served at little stands or bars throughout the city that look like they have been there forever. Behind the counter of most of these outposts was an old Portuguese man (or woman), carefully pouring tiny plastic (or better yet, CHOCOLATE!) cups full of the sticky liquor. The chocolate cups helped the stuff go down a lot and were worth the extra 20 cents or so. They’d ask you if you wanted it with or without fruit, and then after handing over about 85 euro cents, you took your little cup to go, to either be enjoyed in the space outside the bar (and by space I mean street or sidewalk), or really to go, sipping or shooting the stuff as you walked on your merry way. Aside from the obvious flocks of tourists participating in this ritual, there were also a ton of elderly Portuguese people throwing back cup after cup of the stuff, spitting their cherry pits on the ground. One of my travel rules of thumb is that if old local-looking people are doing it, it’s probably worth trying, and this time was no exception to that rule. It’s so different from something you’d be able to do here, so very European in the way I want Europe to be European, that no matter how it tasted, I knew I was going to love Ginjinha.